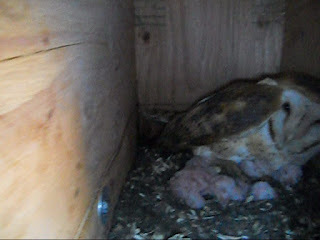 Our resident bird expert Lee Pauser stopped by yesterday to check on the owls and he found a hen sitting with 4 owlets. From his estimation, the oldest appears to be 1 week old. He had placed gophers we trapped in the box on Tuesday and they have already been consumed. We will continue to feed the owlets into maturity and look forward to our fine feathered friends arrival!